Dad on the deck with Hendrix. Mom in the kitchen with The Lumineers. Kids in the family room with Florida Georgia Line. That's what Whole House Audio is about. Whatever you want to listen to, wherever you want it, from any of your sources - internet streaming, iPad, ripped music library on a NAS. We can help you determine what system suits your needs, how to configure it, install it, and show you how to use it. ​We offer wired systems from Russound, the long time leader in this category, and wireless systems from Denon, Polk Audio, Yamaha and Definitive Technology. Wireless systems are made to be controlled with a tablet/smart phone app supplied by the manufacturer. They are free on the Apple App Store or GooglePlay Store. Russound has been building high quality distributed-audio products since 1967. They make products for all budgets, but if you want the best and most capable, take a look at the MCA-88X controller/streamer that supports in-wall touchscreens, intercom, streaming sources, and tablet/smart phone control. Russound products must be installed by a Russound Certified Installer, which we are. Together or individually, these acoustically sculpted, stylish and powerful speakers deliver pure, precise sound. Group them together to synchronize the sound, or send a different selection to each room. Control it all with your Android or iOS device. You can also use your own speakers by adding the HEOS amp. Superb sound quality and control from Denon. 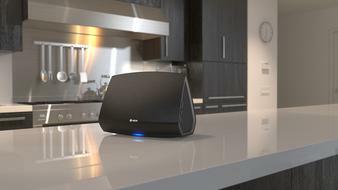 Yamaha brings their long history to the wireless category with their MusicCast system. MusicCast is built into many of their home theater receivers, making the link between your home theater and wireless system seamless. Audiophile-level sound quality and construction. Uses the Play-Fi open platform technology that allows you to add wireless Play-Fi components from other manufacturers. Value-oriented wireless system. Uses the Play-Fi open platform technology that allows you to add wireless Play-Fi components from other manufacturers.